NMDA receptors are eminently druggable. But achieving selectivity is important. Emory researchers have determined that the receptor assembly of interest in the cerebellum and thalamus has distinct electrochemical properties. From Strong et al, Expert Opinion on Therapeutic Patents (2014). Researchers at Emory have been probing one variety of NMDA receptor assembly found in the cerebellum, and also in the thalamus, a central gateway for sensory inputs, important for cognition, movement and sleep. This variety includes a subunit called GluN2C - together with two partners, GluN1 and GluN2A. Using drugs that are selective for particular combinations of NMDA receptor subunits, Traynelis' laboratory showed that an assembly of GluN2A and GluN2C is the dominant mouse form in the cerebellum. When GluN2C is introduced into cortical neurons, it prefers to pair up with GluN2A, the researchers found. This raises the question in regions such as the thalamus of whether GluN2C also appears with a partner GluN2 subunit. 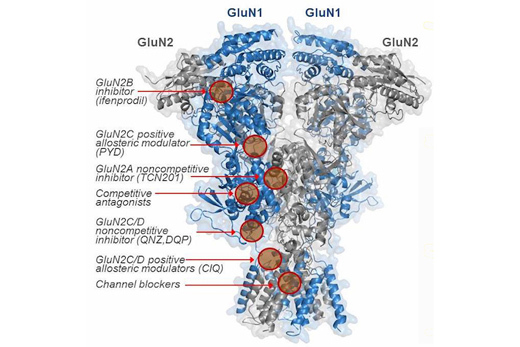 They also observed that the GluN2A-GluN2C assembly has distinct electrochemical properties.